Pioneers in the industry, we offer ruby pendant set, ruby pendant set in silver and ruby and diamond 18k gold jewelry pendant set from India. 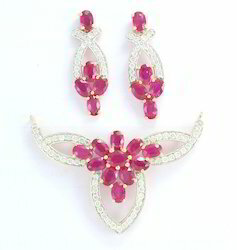 We are engaged in providing an exclusive assortment of Ruby Pendant Set. These real ruby pendant sets are offered in various designs, patterns, sizes and colors to meet the variegated choices and preferences of our customers. Customers can avail these pendant set from us at market leading rates. 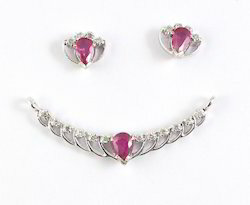 We hold expertise in offering a wide assortment of Ruby Pendant Set in Silver. These are praised for their attractive designs, unique styles and designer appearance. We can also customize the article if requested and use gold or silver. We can use different gemstones & diamonds on demand. Besides, these are also admired for their smooth finish and long lustrous shine. 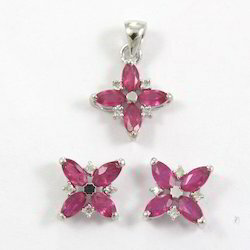 We are involved in offering fine quality Studded Ruby and Diamond 18K Gold Jewelry Pendant Set. These Studded Gold Pendants are highly demanded in the market. This gold plated pendant is manufactured using premium quality of gold and tested for its quality assurance under the supervision of our quality controllers. These gold pendents are crafted by our skilled craftmen using quality products.